For a traditional monk, the cell is a private area existing within the larger context of a shared monastery. The appearance of the cell varies from tradition to tradition. In the Benedictine tradition, it is often just a small room, with a bed, toilet and a few books. That's compared to, for example, the Carthusian tradition, where each monk's cell is much more like a full-fledged apartment, complete with relatively large rooms, hallways, workshop, and even a private garden. 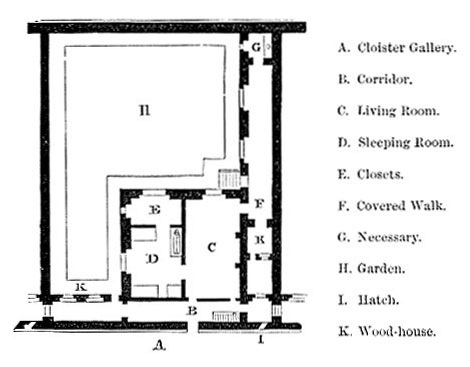 For an urban monk like the Integral Monastic, the cell is simply his or her own city home, usually a modest apartment. In keeping with traditional monastic design, most urban monks choose to decorate their cell sparsely and non-extravagantly, so as to invite a spirit of contemplation, and to keep the mind from getting drawn constantly into worldly affairs. Naturam sequere tuam ‒ be thyself. So, what are some of the practical benefits of the monastic cell, apart from just offering living space? To me, the concept of a cell represents the opportunity for a person to be truly themselves, in the sense of not having to worry about whether or not one is conforming successfully to social norm and convention. Say you sit in the subway, contemplating the emptiness of phenomena, or enjoying a state of Kenosis. I've noticed that in these times, occasionally my facial muscles naturally relax to a high degree, resulting in me looking sick, dead, or pathologically tired from a third person perspective. 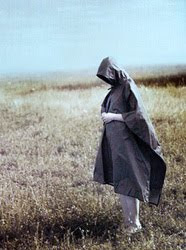 Since looking in this way is, of course, not acceptable in terms of social convention, it's best not to appear like this in public, lest people will be afraid of you, or unwilling to strike up conversation, or call the ambulance. Luckily, the cell offers a kind of sanctuary for a person to be able to be natural and authentic; one is able to temporarily let go of the need to present oneself to others, and allow one's mind and body to flow in whatever way seems natural for the moment. In my experience, this possibility offered by the cell ‒ indeed, any space where one can be certain one's not observed by others ‒ can result in a sense of tremendous freedom. * The English word for cell comes from the Latin word "cella" which means "small chamber" and from the Greek word "naos" meaning "inner chamber of a temple". The sanctuary of authenticity. That's brilliant! Thank you. I discover your very interesting and excellent blog! Have you all a good and peaceful day!